Following the Paris Climate Change agreement, it is vital that global warming does not pass a 2° degree increase, otherwise this could lead to catastrophic climate change. The Province is already experiencing the impact of climate change in terms of drought throughout the countries and flooding in Mozambique. The total known reserves of fossil fuels are currently 2860 Gigatonnes of CO₂ the carbon budget is only 565 Gigatonnes – this is the amount that can be burned to limit a rise in temperature to below 2°. In order to be good stewards of God’s earth, we need to move from fossil fuels. But we also need to be good stewards of God’s money and the reality is that due to those reserves that are cannot be used, the value of fossil fuels will drop – which is known as the carbon bubble. The Bank of England has warned of huge financial risks from fossil fuel investments. 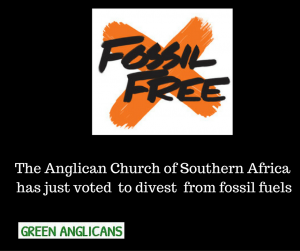 Unlike in other countries where it is relatively simple to divest from portfolios which include fossil fuels and reinvest in fossil free portfolios, in South Africa there are currently no such fossil free portfolios. So the Anglican Church of Southern Africa will be negotiating with financial institutions to encourage them to create such a portfolio. Human induced climate change is now widely regarded as the most pressing issue of our time. Extended droughts are a direct consequence of global warming, with extreme weather events occurring more often. Southern Africa is set to warm at twice the global average. The current severe drought and the resultant food price increases will affect the poorest and most vulnerable members of our society. This report to be tabled at ACSA relevant body and negotiate with financial institutions for these to be created where necessary.